I am very concerned to hear about on-going problems at Riverside pitches. I have raised my concerns with the council's Environment Department. I wanted to know how these problems have happened and I wanted to know what the council is going to do about it. The council should be providing good quality football pitches and I know that across the city they do. The council should be encouraging people to play football - reports that people keep being injured will not do this. it is important that a long-term solution is found to the problems at Riverside. I was pleased to hear from the Environment Department that they are taking my concerns very seriously indeed. The pitch has been put out commission, I have said that the Department must be certain that they have dealt with the problems effectively. I was slightly reassured that the Department told me that there was sufficient provision of pitches across the city to ensure that no-one was missing out. 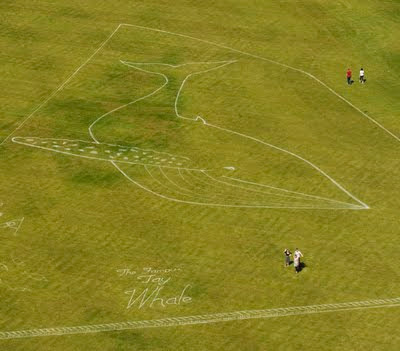 The picture shows the pitches last summer when it had a giant whale painted on it as part of WestFest. I was really pleased that the Scottish Labour Party Conference was in Dundee last weekend. This was a great opportunity to showcase the city of Dundee and also brought significant business to the city. You can read a report of the issues around this in Wednesday's Courier. The Scottish Labour Party Conference was a great success. Delegates loved being in Dundee with many commenting on the great facilities and the friendly welcome. The issue of wi-fi not working in the conference was raised with me by a number of journalists. I have asked David Dorward, Dundee City Council Chief Executive, about this and asked what he is going to do about it. I believe that IT services at the Caird Hall are provided by the City Council and if the city is to continue to attract conferences and events then we need to have IT which is fit for purpose in the twenty-first century. I understand that one of the issues was that there was no staff member available on stand-by to fix wi-fi problems. We need to be sure that we give the impression that Dundee is open for business. I will also be contacting Leisure and Culture Dundee to ask that they thank the Caird Hall staff for their hard work and that they look at what is required to ensure that the Caird Hall remains a great venue for conferences and other events for years to come. 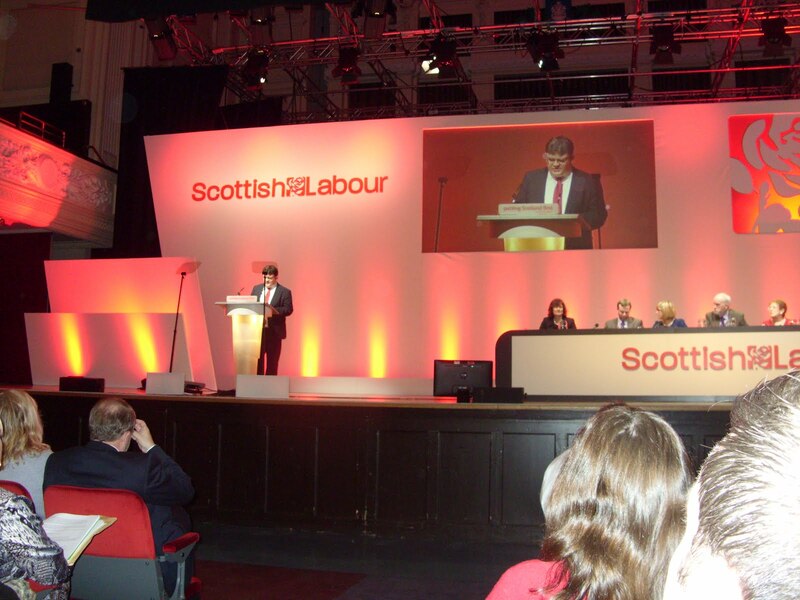 Obviously I have a particular concern because this happened during the Scottish Labour Party Conference but that it not entirely relevant the real issue is does the Caird Hall have the facilities that make it a conference venue fit for the twenty-first century? At the Scottish Labour Conference I was pleased to be asked to speak as a local councillor and as Labour's Environment spokesperson on Dundee City Council at a fringe meeting on Environmental Justice. The meeting was sponsored by Friends of the Earth Scotland, the Scottish Co-operative Party and by SERA Scotland. I followed her by speaking about what councils could do to promote environmental justice. I highlighted the work of the Christie Commission published last year which pointed out that a large proportion of local government income is spent on problems that could have been prevented with earlier intervention. I think that this is particularly true in the area of the environment. I also pointed out that as a member of Dundee City Council I was not able to save the whale but that I could do a number of small things which will go some way to improving the environment. I mentioned in particular graffiti and vandalism. 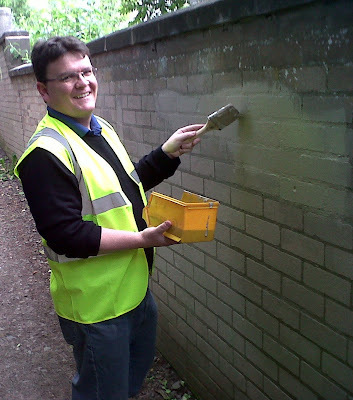 There should be no tolerance of graffiti or other forms of vandalism. Councillors often want to draw attention to big projects, and I'm no different (refurbishment of McManus or developing a new swimming pool), but often the best outcomes come at little or no cost. An example of this would be joining community groups in taking part in graffiti clearance. This also empowers local people and gives them a sense of 'ownership' of their own local environment. I drew attention to councils being the custodians of open green spaces right across the country. These public open spaces have three main functions: to provide opportunities for recreation, to contribute to a sustainable natural environment and to enhance the visual amenity of the urban environment. I also drew attention to the Transition Town movement and perhaps looking at at allowing for more food production in our towns and cities. Ideas like promoting allotments and community gardening, even city orchards. Why don't we plant fruit trees in our parks? Another issue is food procurement by public authorities, local authorities, and others, should look to sourcing food from sustainable local suppliers. I highlighted Dundee Labour's plans to develop an energy-buying co-operative in the city and also look at areas where we could develop local heating systems. I believe that by taking care of the local environment and dealing with issues like fuel poverty we can alleviate environmental injustice. Local government can take care of the relatively small scale issues which could develop into bigger problems over time. By dealing with the local I think that we can go someway to encouraging a concern for the global. People can make a difference to their lives and to their communities, and it is important that they do so. I think that protecting local communities is a vote winner. I think the environmental justice is a vote winner but much much more importantly than that I think that environmental justice is a right and a necessity. 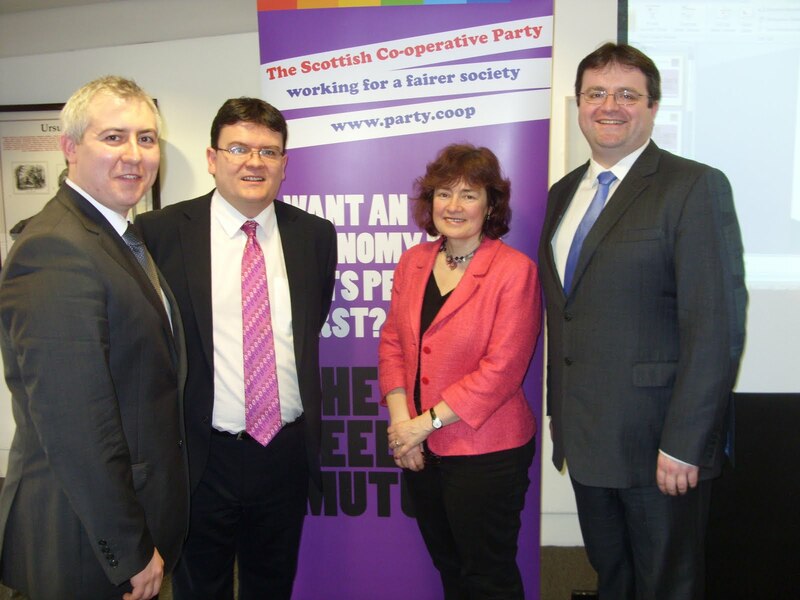 On Friday along with my colleagues Councillor Paul Godzik of Edinburgh City Council, Councillor Stephen Curran of Glasgow City Council and Sarah Boyack MSP Scottish Labour's Shadow Cabinet Secretary for Local Government I spoke at fringe meeting arranged by the Co-operative Party on Co-operative Councils. 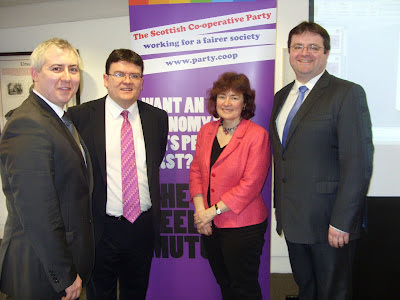 You can read the excellent Scottish Co-operative manifesto for local government here. It was great to hear about the great ideas coming from Edinburgh and Glasgow and also Sarah Boyack's great ideas for local government. 'Firstly, I would like to welcome you to Dundee and now that you’ve come this far along the road welcome the West End. As a trustee of the DCA I would like to welcome you to the DCA. If you get the chance please have a look at the Jane & Louise Wilson exhibition down the stairs or visit the cinema. But I’d also like to point out that DCA is a symbol of what a Labour Council can do for this city. Throughout this discussion on co-operatives I want us to focus on that theme. Back in 1989 with the fall of the Berlin Wall etc we were told that history had ended. The events over the past few years have proven that this was not the case. Shareholder capitalism is not the only show in town. This is the time for co-operatives. The other thing that the events of the past few years have shown is that governance is important. When we promote co-operatives or employee ownership we are often told that so-called ‘ordinary’ people cannot possibly run businesses as well as for example Sir, sorry Mr Fred Goodwin. Governance is important. Over the past ten years most councils have outsourced some facilities to arms-length companies and trusts. I am a member of a number of these including DCA. This outsourcing has made public accountability more difficult, more opaque. For many of these outsourcing trusts the change in governance is in essence a tax dodge. Put the organisation at arms-length, get charitable status and don’t pay business rates. I think that in future where there are moves towards outsourcing Labour councils should always consider co-operative and mutual options. Any Labour councillor or activist who doesn’t want to deliver co-operative solutions should look at co-operative values and principles and tell us why. Co-op values self-help; self-responsibility; democracy, equality and solidarity. Co-op principles voluntary and open membership; democratic member control; member economic participation; autonomy and independence; education; co-operation among co-operatives and concern for the community. Why should we move toward co-operatives? I think that there are a number of areas where co-operative solutions would be good in local government. One area that we should look at is social care. Many local authorities are outsourcing in this area. We should look at encouraging social care workers to form workers co-operatives. What would be wrong about mostly low-paid, mostly female workers being in charge of their own destiny? Within social care we should consider the personalisation agenda. For those who have long term care needs we should consider a consumer co-operative. This would take away the problems of having to do all the HR functions. This would empower people with long-term care needs; we need to move away for paternalism. What have we got to fear from allowing people to have an effective say over how they are cared for. One size does not fit all. An example of social care co-operatives can be found in Highland Home Care. There are many co-operative solutions which can make a difference in our communities. I am very impressed by what is going on in Glasgow with regard to Credit Unions. In this ward over the last year the state-owned RBS has closed two branches, taking services away from local people. We need to do more to promote credit unions. I’m delighted that Dundee City Council encourages children in our primary schools to save through Discovery Credit Union’s ‘Saved by the Bell’ programme aimed at pupils. One of the main challenges facing local government in Scotland over the next few years is the ongoing pressure to share services. My view is that if we want to re-establish Tayside Regional Council or even Strathclyde Regional Council we should legislate for it not do it by stealth. The Clyde Valley process has fallen apart due to problems over governance. Co-operatives could be used to create separate legal entities which would be responsible for linking up shared responsibilities and be democratically accountable to the communities they serve. The shared services agenda should not be about secret deals behind closed doors, which give the people who pay for and effectively own these services the chance to have some control over these. Here in Dundee in our manifesto we aim to deal with fuel poverty by developing an energy purchasing co-operative. In my ward, less than a mile from here we have the first council housing built in Scotland in 1919. The Logie Estate had a communal heating system when it was built. The collective power model would allow baulk buying of energy from the wholesale markets to reduce energy prices and fuel poverty. We could also include greater environmental standards in any such purchasing. Across the councils that you’ve heard from today co-operative solutions offer real solutions which would make a real change to people’s lives. The Scottish Labour Party Conference has been in Dundee over the weekend, I have really enjoyed the chance to meet up with comrades and fellow co-operators from across the country. It is always a good chance to listen to new ideas and hear about how things are done differently elsewhere. 'My colleagues Kevin Keenan welcomed you to the city of Dundee yesterday as the CLP Secretary I’d also like to welcome you to Dundee. I am the Labour councillor for the West End ward on Dundee City Council, and I’m looking forward to being the Labour and Co-operative candidate for the West End at the forthcoming election. I am pleased that these elections are going to be only on the issues for local government. We need to focus on local government. The centralising SNP do not care about local government. We should be arguing for the merits of local government. When we are discussing Scotland’s constitutional future we should return to the principle of subsidiarity. Decisions should be taken at the most local level possible. That means letting local government be just that local government. Scottish Labour is putting Dundee First by prioritising jobs, education and the care of vulnerable. We will give local people the ability to influence council policies. We will be consulting on our manifesto. Labour in Dundee has already stood up for education in the city and stopped the SNP’s mad plan to close the University of Abertay Dundee. We have been told by the local SNP that over £4 million of cuts will make this city’s education service better! We would prioritise investment in education. We would ensure that every child in Dundee has the best start in life possible. Dundee Labour will put Dundee families first by delivering the Living Wage for Dundee City Council workers and we would encourage other employers in the city to pay this rate and we will use council procurement to deliver on this. Dundee Labour will combat fuel poverty by setting up an energy-buying co-operative which would allow Dundonians to buy energy at reduced prices. This will go some way to combating fuel poverty and would go hand in hand with other measures to reduce energy consumption. Many delegates will have noticed the roadworks that are going on around the conference venue this is all part of the waterfront redevelopment. Scottish Labour will deliver the V & A at Dundee. A great British institution helping to make our great city even better. Local government needs to be just that local government. It needs to be responsive to the needs and aspirations of all of the people of our city.